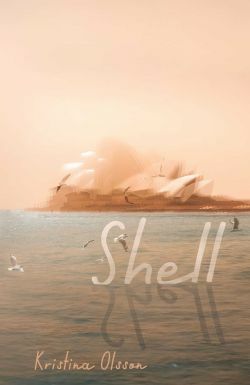 The cover image of Kristina Olsson’s Shell depicts the iconic Sydney Opera House shimmering in soft light. Captured by French-Australian photographer JP Bratanoff-Firgoff, the image is an incredibly apt representation of a novel that glistens. Luminescent is the word that comes to mind – which may have something to do with the fact that I read this novel while visiting Sydney in spring. Wandering Circular Quay, I inhaled Shell in gloriously sunny moments in the Botanic Gardens. I like to read novels while travelling as a way of coming to know a place – especially a city like Sydney, which is relatively unfamiliar to me. Shell tells the intertwining stories of Pearl Keogh, a fierce, yet guarded, young Australian journalist and Axel Lindquist, a visionary glass artisan from Sweden, commissioned to make a sculpture for the Sydney Opera House foyer. Playing out in 1965, their individual stories are set against the backdrop of the construction of the Sydney Opera House and the building tension of the Vietnam War. Reading Shell I learnt for the first time of the controversial and transformative history of this building commissioned in the 1950s. Its Danish design, with every tile hand-crafted in Sweden, emerging on Bennelong point ‘like an eruption’. In this way, Olsson’s novel is an ode to craftsmanship and the translation of life into art. It is also an ode to Sydney. But Olsson’s love letter to Sydney refuses nostalgia. Through Lindquist, whose uniquely Swedish perspective provides an outsiders view of Australian culture, and Keogh, whose experience of a male dominated world provides an insiders view of white Australian masculinity, Olsson offers a sharp critique of Australia in the 1960s. It is an Australia that struggles to imagine otherwise, to aspire: ‘As if they were ashamed of a building that might reveal them, the soaring shapes of their dreams, the true interior of their hearts. As if they were afraid of grandeur’. It is also an Australia that feels surprisingly familiar here and now (the latest political episode regarding advertising on the opera house sails revealing that we may not have grown up at all). Art, Olsson seems to suggest, may be the only antidote: ‘The government might want the definitive, everything reduced to its baseline, a rule. But Axel knew that, in art, there was no such thing as certainty’. Shell is a superb and intricate novel of loss, love and the impossibility of impartiality. Bringing a city alive as only great writers can – Olsson makes Sydney sing.